Can a book help the church stay together? Members of the Commission on a Way Forward converse with each other as they complete their final commission meeting on May 23 at the Upper Room chapel in Nashville, Tenn. Many commission members credit the book “The Anatomy of Peace” with helping them work together. Photo by Maidstone Mulenga, Council of Bishops. Before dealing with a divided church, the Commission on a Way Forward first needed a way to deal with each other. The diverse group of 32 United Methodists — charged with helping the Council of Bishops find ways across the denominational divide over homosexuality — came from nine countries and various walks of life. They had their own conflicting ideas of how the church should minister with LGBTQ individuals. With that in mind, the commission’s three bishop moderators encouraged members to read “The Anatomy of Peace: Resolving the Heart of Conflict” before they began meeting in January 2017. Later that year, the United Methodist Council of Bishops also discussed the book during its fall meeting. After nine meetings, the commission has concluded. A majority of bishops have made a recommendation for a Way Forward, based on the commission’s work. Now, the conversation moves to the delegates who will have final say at the 2019 special General Conference. Many delegates are including the book in their conversation. So what does a book produced by the secular Arbinger Institute have to offer what is essentially a religious debate? In preparation for the special General Conference in 2019, United Methodists are using this Arbinger Institute book on conflict resolution. 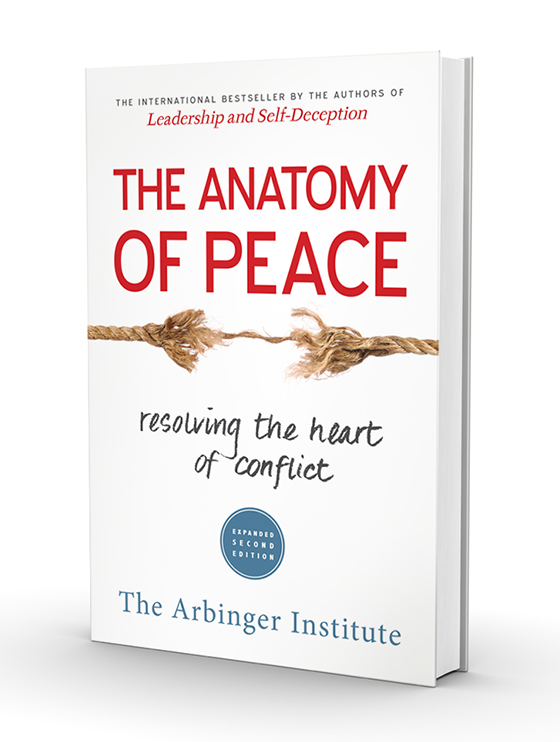 Art for “The Anatomy of Peace” courtesy of The Arbinger Institute. “It’s a book that is just chock full of a lot of the very principles that Scripture teaches about the value of people,” said the Rev. Jorge Acevedo, lead pastor of Grace Church, a multi-campus United Methodist congregation in southwest Florida. He first encountered the book through Spiritual Leadership Inc., which offers coaching to church leaders. The book, he and other commission members said, can help United Methodists remember what it takes to love their neighbor even in contentious times. The book portrays a discussion that takes place among parents and instructors at an Arizona survival camp for young people trying to overcome drug addictions. In the book, a Palestinian Muslim and Israeli Jew jointly run the camp. While the setting is fictional, the conflicts the parents face in their lives and in dealing with each other are real. The story expands on two basic ideas: 1) People should spend more time on helping things go well than trying to fix what’s gone wrong. 2) To help things go well, individuals must develop hearts at peace rather than at war. That means seeing people as people, not as objects or obstacles. Two commission moderators — West Virginia Conference’s Bishop Sandra Steiner Ball and the Florida Conference’s Bishop Kenneth H. Carter Jr. — had used the book before the Way Forward process. Steiner Ball said the book had a “profound influence” on the commission. Carter, who is now the Council of Bishops president, said a heart at peace is not about just being nice to another person. Praying our Way Forward begins a new phase on June 3. Image courtesy of Council of Bishops. The Council of Bishops, in partnership with The Upper Room, is launching the third phase of Praying our Way Forward, which will continue from June 3 to the Special General Conference in February 2019. Pause and pray for our church’s mission and way forward daily for four minutes from 2:23 through 2:26 a.m. or p.m. in their own time zone OR at another time. This is because the Special Session of General Conference will be held Feb. 23-26, 2019. Pray using a weekly prayer calendar that will be posted on the UMCPrays.org website from June 2 through the end of February 2019. Dave Nuckols, Minnesota Conference co-lay leader and treasurer of the Connectional Table, stressed that the commission used additional resources — not least of all, the Bible. Early on, he said, the group particularly focused on Galatians, Paul’s epistle to a group of early Christians facing their own conflicts. The commission also used the TED talk Danger of a Single Story by Nigerian author Chimamanda Ngosi Adicie. In the video, Adicie tackles misconceptions about African nations and the dangers of stereotyping more generally. Nuckols found the warning against stereotypes particularly helpful, and is urging the Minnesota delegation to use the TED talk as well as the book. “It’s easy for some Western progressives to resent the current General Conference deadlock without taking time to understand the social realities of the non-Western world,” he said. The denomination’s Book of Discipline currently says that while all people are of sacred worth, the practice of homosexuality is “incompatible with Christian teaching.” The book lists officiating at same-gender unions and being a “self-avowed practicing” gay clergy member as violations of church law. The bishops are recommending what they call the One Church Plan that would leave questions of ordination and marriage closer to local church level, but not compel anyone to violate their conscience. A number of commission members, including Berlin, support that recommendation. But not all. The Rev. Thomas Lambrecht, the vice president of the unofficial advocacy group Good News, said he and other leaders of like-minded unofficial advocacy groups will push for the Traditionalist Plan. That proposal would keep church restrictions and aim to increase enforcement. Commission on a Way Forward members talk during the closing of the last last meeting. Bishops Gregory Palmer and David Yemba look on. Photo courtesy of Commission on a Way Forward Facebook page. Matt Berryman, fellow commission member, agreed the book is helpful, but said the book falls short in dealing with situations where one group has far more power than another. “If an elephant is standing on the tail of a mouse, it’s not the job of the mouse to have a heart of peace. It is the mouse’s job to say ‘Ouch. Stop,’” he said, riffing on a famous quote by Anglican Archbishop Desmond Tutu. Berryman, who is openly gay, is former executive director of Reconciling Ministries Network, an unofficial advocacy group that calls for full equality of LGBTQ members. Under current church rules, Berryman sees LGBTQ individuals as the mouse. The Rev. 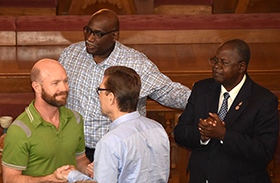 Brian Adkins, openly gay pastor of Open Door United Methodist Church in Richmond, California, shared some of Berryman’s misgivings about how the book handles power dynamics. Nonetheless, he also found the book most helpful in keeping everyone engaged and at the table. Retired Bishop Rosemarie Wenner of Germany said she hopes to see that same kind of enegagement at the 2019 special General Conference. She and other commission members are working to share the principles of the book with United Methodists in the central conferences — church regions in Africa, Asia and Europe. Bishop Sandra Steiner Ball said United Methodists will need a new approach to General Conference if they are to move through their impasse around homosexuality. Bishops are recommending a plan allowing more freedom around LGBTQ ordination and marriage, but submitting three plans to General Conference. Question to court: Who can submit petitions? In a two-hour session, streamed online, Judicial Council heard arguments about petitions related to the special General Conference in 2019.